A3+ Size 12 x 16.5 in. (304 x 420 mm) 13 x 19 in. MEDIUM 13.9 x 20.9 in. (352 x 530 mm) 17.5 x 24 in. LARGE 20 x 30 in. (508 x 762 mm) 24 x 35 in. Dorje Drolo (rdo rje gro lod), meaning the ‘Pot-bellied Vajra’, is one of the ‘Eight Manifestations’ of Guru Rinpoche or Padmasambhava, and the extremely fierce form he assumed at thirteen different Himalayan locations with the name of ‘Tiger’s Lair’, such as at Senge Dzong, Pemako, and Paro Taktsang in Bhutan. Guru Rinpoche manifested in this terrifying aspect in order to subdue the most malevolent and arrogant spirits that inhabited these regions, with the transformed aspect of his consort Tashi Chidron serving as his ferocious tigress vehicle or mount. Tashi Chidron (kra shi spyi dron) was one of the five consorts of Guru Rinpoche, and recognized as an incarnation of Samaya Tara. She was born with the name of Khidren (khyi ‘dren), then later renamed as Tashi Chidron by Yeshe Tsogyal. Khidren was as the daughter of King Hamray, who at that time ruled over the mountainous Mon country to the south of Tibet, which includes the present day kingdoms of Sikkim and Bhutan. Inspired by a prophecy from a dakini in a dream, she traveled to Lho-drag in southern Tibet to meet Yeshe Tsogyal, whom she receiving many teachings and initiations from. Then she met Guru Rinpoche, who gave her further teachings, through the practice of which she soon gained great spiritual accomplishments or siddhis. Guru Rinpoche then took her as his ‘karmic consort’, and at the precipitous ‘Tiger’s Lair’ cave-site of Paro Taktsang in Bhutan he practiced the sadhana of Vajrakila with her. And when Guru Rinpoche manifested as Dorje Drolo, she transformed herself into a fierce tigress to serve as his mount, and in this form they oath-bound many of the powerful non-human spirits of Tibet and Bhutan, then later she assisted him in concealing many terma treasures. Dorje Drolo is extremely wrathful and dark-brown or maroon in colour, with three eyes, two arms and two legs. In dynamic pratyalidha posture he leans towards the right as he dances upon the back of a fierce lactating tigress, which is a symbol of fearlessness and protection, as a maternal tigress will let no other creature approach her offspring. The tigress rips out the blood-dripping hearts and life-veins of two obstructive male and female demons with its right claws. The male demon appears in the form of a blue gyalpo demon or spirit-king that in a previous existence may have been an important lama or minister who broke his vows. He appears here thrown down upon his back, wearing the robes and golden riding hat of a monk, with his feet pinned down by the tigress’s front left paw. The naked female demon has also been cast down upon her back, with her head pinned down by the tigress’s rear left paw. Both of these demonic enemies lie prone upon on Dorje Drolo’s golden sun disc, which rests above a multicoloured lotus and a triangular vajra-rock formation. Dorje Drolo frowns fiercely as he hisses, whistles and bites down on his lower lip with his sharp white upper teeth and fangs. The red facial hair of his eyebrows, mustache and curling beard blazes upwards like tongues of fire. His three round red eyes are angry and menacing, the tawny curls of his hair are piled up on top of his head, and his long sharp fingernails are curved like white crescent moons. He wears three robes of embroidered and multicolored silks that billow and fold around his powerful pot-bellied body: a white under-robe, a blue robe with wide sleeves and a yellow inner-lining, and an outer red patchwork robe. These robes represent his mastery over the three Buddhist yanas or vehicles: with his white ‘inner’ robe representing his perfection of the bodhisattva vehicle, his blue tantric robe his perfection of the mantra vehicles, and his red monastic robe the perfection of his pratimoksha vows. His ceremonial boots are fashioned from felt and leather, and around his neck he wears a garland of severed heads that are strung together on a thread of intestines. He is adorned with bone earrings, bone bracelets, a filigree bone necklace that encircles his chest with an eight-spoke wheel at its centre, and a few strands of his bone apron appear from beneath his robes. With his right hand Dorje Drolo holds aloft a blue vajra made from meteorite iron, with which he is prepared to strike the skull of an enemy. With his left hand he grasps the handle of his ritual-dagger or kila (Tib. phurba) as he thrusts its sharp point towards the heart of a demonic enemy. The triangular and three-sided blade of this dagger is fashioned from blue meteorite iron, and its golden top is ornamented with the faces of three wrathful deities and a crowning half-vajra. A white silk ribbon is tied onto its knurled handle, and at the base of the handle is the ferocious head of a makara or ‘crocodile’ that is devouring the entwined tails of two naga-serpents. The index finger of this hand is raised in the threatening tarjani gesture, and he unleashes a black iron scorpion from the tip of this finger. The scorpion represents his ability to control the ‘eight classes of spirits’ and especially the plague-causing demons that manifest in the form of black scorpions. Dorje Drolo is surrounded by a blazing mass of awareness fire, and above his head flies a serpent-devouring garuda. 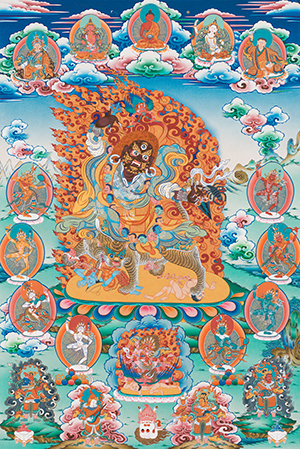 Encircled by dark storm clouds and a blazing mass of awareness fire directly below Dorje Drolo’s sun and lotus-seat is the wrathful yaksha form of the ‘Dark -red Butcher,’ (bshan pa dmar nag), who is seated in sexual union with his red yakshini consort . Together they ride upon a fierce, horned snake-devouring garuda that crushes an enemy lying prone upon their golden sun-disc and lotus seat. Their ferocious faces have three bulging red eyes, gaping mouths, and they both wear five-skull crowns and bone ornaments. The Dark-red Butcher wears an upper garment of silk, and the flayed-skins of an elephant, a human and a tiger, while his consort wears a short leopard-skin skirt, and she holds a warm heart in her left hand, while her right hand holds a curved knife behind his neck. With his first pair of right and left hands the Dark-red Butcher holds a curved knife above a skull-cup, while with his second pair of hands he holds a sword and the warm heart of an enemy. Surrounded Dorje Drolo is his retinue of four male dakas and four female dakinis, who all stand in dancing bow-and-arrow posture upon white moon-discs and pink lotus pedestals. Each of these figures is encircled by a radiant blue inner aura and a red outer aura, and they are paired to correspond to the four directions with a white, yellow, red, and green daka and dakini respectively appearing in the east, south, west and north. All of the dakas and dakinis have three eyes, semi-wrathful expressions, and wear bone ornaments and five-skull crowns. Each daka’s topknot is adorned with three small triangular flags that are adorned with cotton balls, and they all wear brocaded cloud-collars, tiger-skin loincloths, and rainbow-striped silk trousers. With their left hand they each hold the wooden handle of a round double-headed drum, which they beat with the curved drumstick they hold in their right hand. The four dakinis are naked, with beautiful nubile bodies, and they each bear the attributes of a vajra-handled curved knife and nectar-filled skull-cup in their right and left hands, while the shaft of a trident-topped khatvanga rests in the crook of their left arms. Across the bottom of this thangka are the standing forms of the ‘Four Great Kings’ (Skt. caturmaharaja; Tib. rgyal chen sde bzhi), who guard the four directional faces of Mount Meru and are coloured to accord with the face they guard: white (east); blue (south); red (west), and green (north). In the bottom right corner is the Great King Virudhaka, the guardian of the south, who is semi-wrathful and blue in colour with two round and piercing eyes. He is the leader of the kumbhandas or ‘dwarf demons’, who are associated with cemeteries and hungry-ghosts or pretas. His helmet is fashioned from the fierce head of a makara or water-monster (crocodile), and he wears a leopard-skin shawl atop of his armour, and the skin of a green naga-serpent hangs from the white belt at his waist. He appears amidst a swirling green mass of wind and his attribute is a sharp iron sword, which he unsheathes with both of his hands. To the right of Virudhaka is the Great King Dhritarastra, the guardian of the east, who is white in colour with a peaceful expression. He is the leader of the gandharvas or ‘scent-eaters’, who serve as the semi-divine musicians of the gods. He appears amidst clouds and his attribute is a lute or vina, which he plays with both of his hands. To the right of Dhritarastra is the Great King Vaishravana, the guardian of the north, who is golden-yellow in colour with a slightly wrathful or stern expression. He is the lord of the yaksha race of beings, the nature-spirits that served as guardians of treasures hidden beneath the earth in the early Indian traditions. He appears amidst clouds, wearing a five-jewel crown and a naga-skin that hangs from his belt. With his right hand he holds aloft a silken victory banner, and with his left hand he holds a treasure-disgorging mongoose. In the bottom right corner is the Great King Virupaksha, the ‘ugly-eyed’ guardian of the west, who is red in colour with a slightly wrathful expression. He is the leader of the nagas or serpent-spirits that control rainfall and drought, and serve as treasure-guardians of the underworld and aquatic realms. He appears amidst a swirling green mass of wind, and his attributes are a white stupa or chorten that he holds aloft with his left hand, and a green serpent that he holds with his right hand. The offerings of stacked jewels, along with several emblems of the chakravartin or ‘universal monarch’, appear in front of the lotus-pedestals of the lower daka and dakini. In the lower left and right corners are two skull-cups mounted upon skull-tripods, with the left skull-cup containing swirling red blood, and the right one swirling blue nectar. The inverted skull with its scalp at the bottom centre contains a wrathful offering of the five torn-out sense organs; eyes, ears, nose, tongue, and heart. Enthroned upon moon-discs and lotus seats amidst the clouds in the upper sky is the central form of Amitabha Buddha and four lineage masters. Amitabha, as the ‘Lord of the Padma or Lotus Family’ is red in colour, wears the three robes of a nirmanakaya Buddha, and his hands are folded on his lap in the dhyana-mudra of meditation as he supports his blue alms bowl. To Amitabha’s left is the sambhogakaya form of a red bodhisattva who may be identified with Vajradharma (rdo rje chos), the ‘keeper of secrets’ and peaceful aspect of Vajrapani who compiled the ‘Eight Transmitted Teachings’ of the Nyingma Kagye tradition. With his right hand he holds an eight-faceted wish-granting gem in front of his heart, and with his left hand he holds a nectar-filled skull-cup. In the top left corner is Guru Rinpoche, the precious ‘Lotus-born’ guru from western India that introduced the Vajrayana teachings into Tibet, and who manifests here in the form of Dorje Drolo. Guru Rinpoche wears the three white, blue and red robes of the ‘three vehicles or yanas’, his ‘lotus-hat’ and the outer brown robe of a king. With his right hand he holds a golden vajra, and with his left hand a nectar-filled skull-cup that contains a golden long-life vase, while his trident-topped khatvanga rests in the crook of his left arm. To the right of Amitabha is the dakini Yeshe Tsogyal, the principal female disciple and Tibetan consort of Guru Rinpoche, who appears here wearing the eight jewel ornaments and five silk garments of a sambhogakaya goddess. She is peaceful and youthful, white in complexion, and sounds a wooden damaru or pellet-drum with her raised right hand, whilst holding a nectar-filled skull-cup with her left hand. On the far right is Kichung Lotsawa, meaning the ‘Young Translator’, one of the twenty-five main disciples of Padmasambhava, who as the incarnation of an early Indian pandita was thus able to learn Sanskrit easily while he was still very young. He received teachings from Guru Rinpoche and lived in eastern Tibet as a lay practitioner who would later incarnate in the forms of Dudjom Lingpa and Dudjom Rinpoche. He is shown holding a bird to represent his miraculous ability to summon birds from the sky with a gesture of his fingers, and to communicate to them the ephemeral nature of cyclic existence.